particular moral, the story line is minimal, there is no bear! very happy and satisfying ending. I remeber this book from when I was a child. I just rediscovered it here on Amazon and boy did the memories come flooding back of my mother reading it too me over and over again each night before I went to bed. A very sweet and fun tale. Who is the big hungry bear? "Hello, little mouse. What are you doing?" This is a cheeky story. It is beautifully illustrated, and although it does not have a lot of words, it is very engaging and funny. All Preschoolers love this book! I found this book at the library when searching for books for my preschool class. I had never read it before, but I love Don and Audrey Wood and I thought the children would enjoy the charming illustrations and the simple text in this book. Boy was I right! This book quickly became the favorite of the entire class. When choosing books for naptime, the children would inevitably argue over who would have this book on his or her cot so I began to read it to ALL of them before they went to sleep. Pretty soon they had memorized the text and would say it out loud with me. When it was time to take it back to the library we had a going away party, complete with mouse ears and, of course, red, ripe strawberries! When I was transferred to another preschool with children from at-risk backgrounds, they too loved this book! Many of these children who already had very tough exteriors at ages 3 and 4 would simply melt for this book! My reciting the text of this story helped one little boy with multiple health conditions to remain calm during some pretty scary times. Great book but order right size! Love! Love!! Love!!! this book!!! Very enjoyable book to read with your toddler! 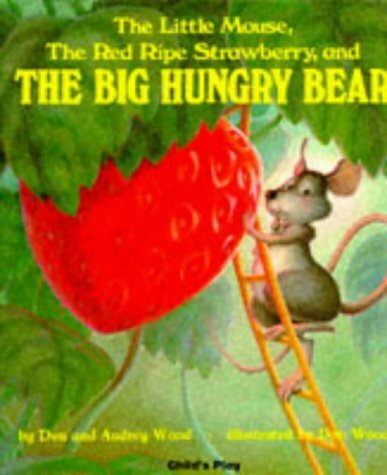 I saw it at the Library a few weeks ago and just loved the way the narrator talks to the little mouse. The illustrations are also enchanting. We loved the story and the illustrations. We had it for years and read it to our grandchildren, who enjoyed it very much. Perfect for ages two to six. So far , LOVE all Wood/Wood books! Where, or where, is the big hungry bear? To anyone about to order this book: If you can get the hardback edition, just go for it. This is a story that children, toddlers especially, will want to read over and over again. And to anyone who stumbled upon this title: It REALLY is as good as the reviews make it out to be. The illustrations have a remarkable way of pulling the reader into the world of the mouse. They are bold and vivid. The story is suspenseful and teaches a valuable lesson about sharing. Get's kids giggling every time we read it.